Direct on frozen sections of human tonsil. Our Abpromise guarantee covers the use of ab8822 in the following tested applications. Publishing research using ab8822? Please let us know so that we can cite the reference in this datasheet. Thank you for your email. Unfortunately we only have the same lot in stock, would you like a replacement from the same lot or an alternative product? We will be able to organise the replacement with Cedarlane. Looking forward to your reply. 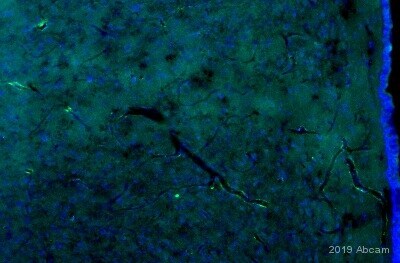 Does this antibody stain fibronectin? I am using a fibronectin-coated coverslip, and am seeing high background as if the antibody is staining the fibronectin. Thank you for your enquiry. We do not test this antibody for cross reactivity with Fibronectin. However as Fibronectin is a glycoprotein which binds Heparin, Integrin and Collagen like Von Willebrand factor and that the immunogen for this antibody is not a specific part of Von Willebrand factor but the whole purified factor there could be cross reactivity. I hope this information helps, please do not hesitate to contact us if you need any more advice or information. Would it be possible to get a sample of the antibody to try on mouse? 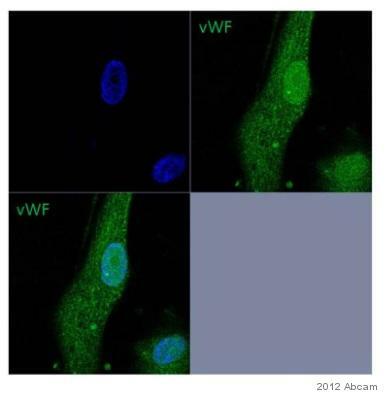 does the anti von Willebrand factor (VWF - ab8822) Ab cross react with rat von Willebrand factor on IF and IHC. As stated on the datasheet, this antibody has only been tested with humans. IF is the only application tested.